I’m not sure how I managed to visit so many different places in Ecuador in just two weeks. 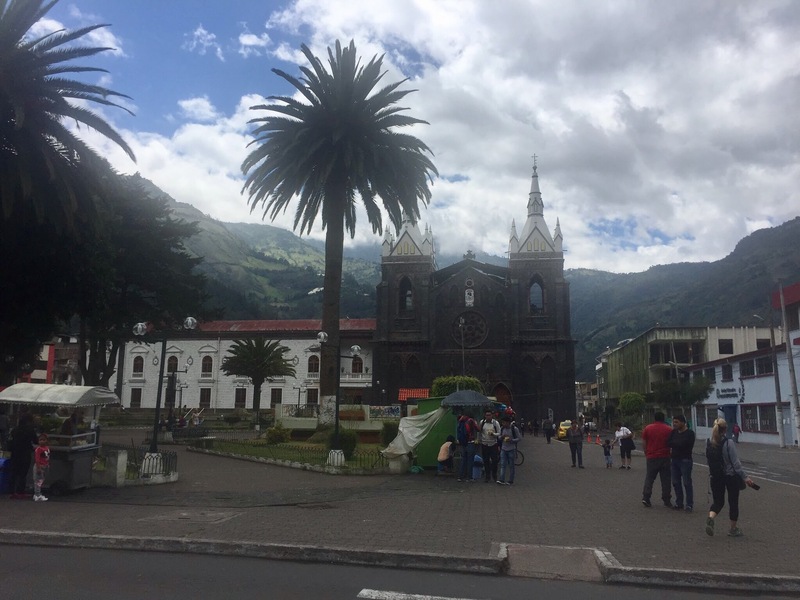 Quito, Quilotoa, Mindo, Cotopaxi, Baños and Cuenca. It’s not a large country in terms of land mass but the Andean mountains and volcanoes do slow you down. 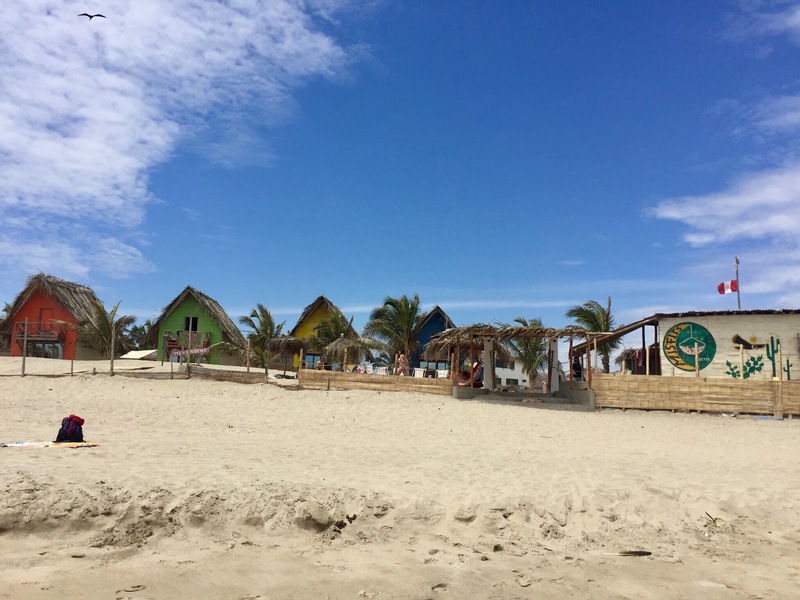 Maybe it’s because there’s more of a well-travelled route in Ecuador so the tourism is more established – I kept meeting the same groups of people in different hostels in every town and city. 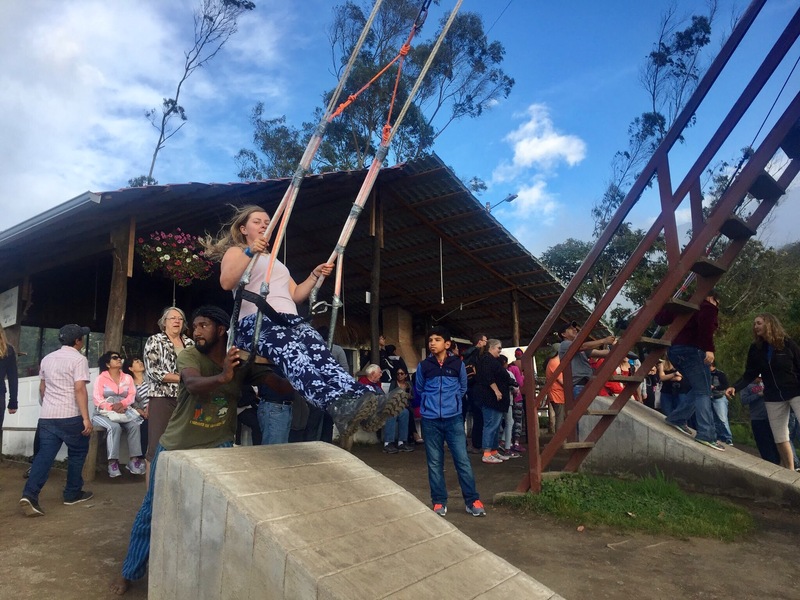 But I’m still on track with my plans and although I would have liked to spend more time in Ecuador and there were more places I could have to seen, by the end I was definitely excited to move onto Peru. 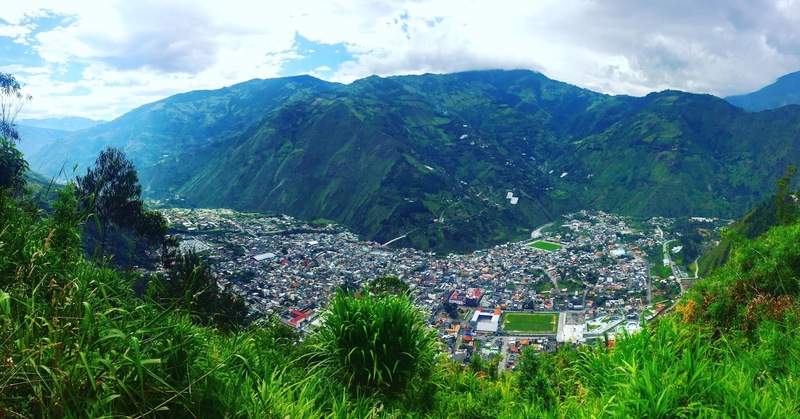 One of my final stops in Ecuador was the highly touristy mountain town of Baños. If I thought Mindo was touristy then I was in for a surprise. Baños de Agua Santa is named after the natural volcanic hot springs which are occur in the town and surrounding areas. Today it serves as a tourist hub for high adrenaline activities such as white water rafting, canyoning, mountain biking, bridge jumping (like bungee jumping except you jump with a rope instead) and quad biking. 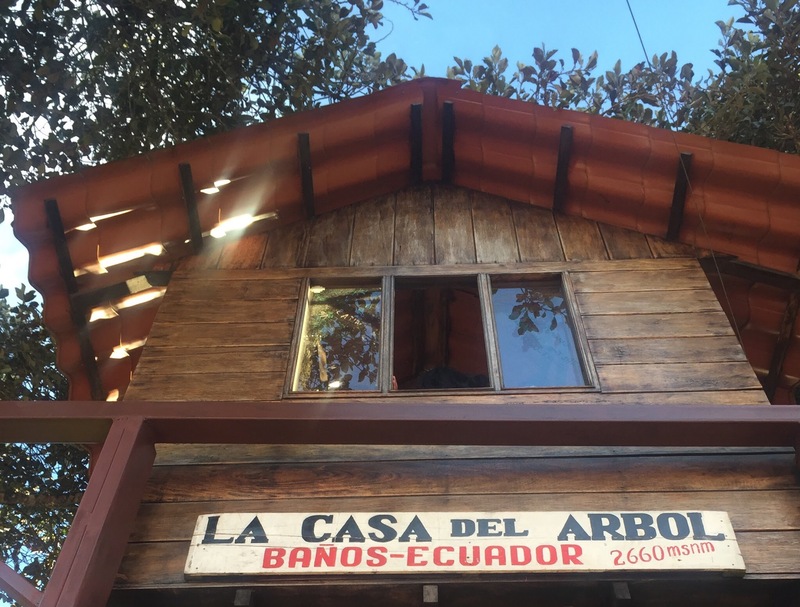 I arrived in Baños in the early evening – it was dark and just starting to rain. Without a map downloaded on my phone or an address for my hostel (great forward planning here) I joined another backpacker in the search for their hostel to take advantage of their WiFi. Baños at night is not a very nice place to be, not because of safety but because the streets are lit up with flashing signs and cheap takeaways. It’s commercial almost to the point of tacky and the authenticity that Mindo has is completely washed away here. I had managed to book a hostel on the outskirts of town which meant I had a bit of a walk with my big bags. When I finally arrive I was gutted to find out the WiFi didn’t work in this hostel either. How was I supposed to make any future plans without the internet for research or booking? The free dinner at the hostel nearly made up for it and the quick laundry was good but I did start to crack up a little. Still feeling positive though, I went to bed early thinking everything would be better in the morning. Unfortunately I was wrong after being woken up at 1am by a cat sleeping on top of me. As you’ll know if you read the last blog post, animals are not my thing and despite living with cats in London for the last year, I do not want a semi-stray cat on top of me in the middle of the night, especially because I haven’t had a rabies inoculation. More cracking up happened as I desperately ushered the cat out of the dorm without touching it (clapping loudly is the best method). There was no way I was risking the same thing happening again so I climbed into the empty top bunk and fell asleep soon after the trauma had faded from my thought. The next morning I got up early and decided I would not stay the second night in that hostel, despite having already paid for it. I spent most of the morning in an Internet cafe catching up with family and friends, and uploading my blog. 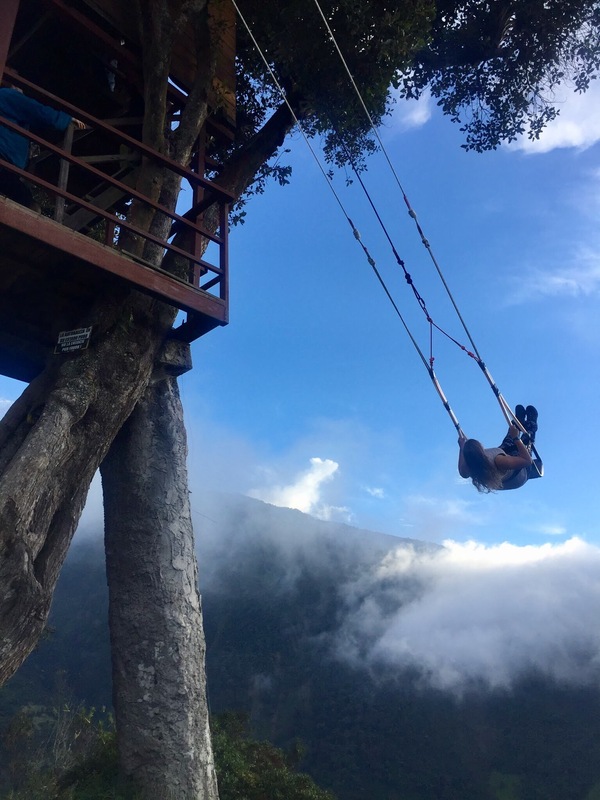 In the afternoon I wanted to go to The Swing or La Casa del Arbol (The Treehouse). This was the main reason I had wanted to come to Baños but I didn’t know much about it other than the pictures I’d seen online. At the hostel I asked if you could walk there and they gave me directions and showed my a vague route on a cartoon map. 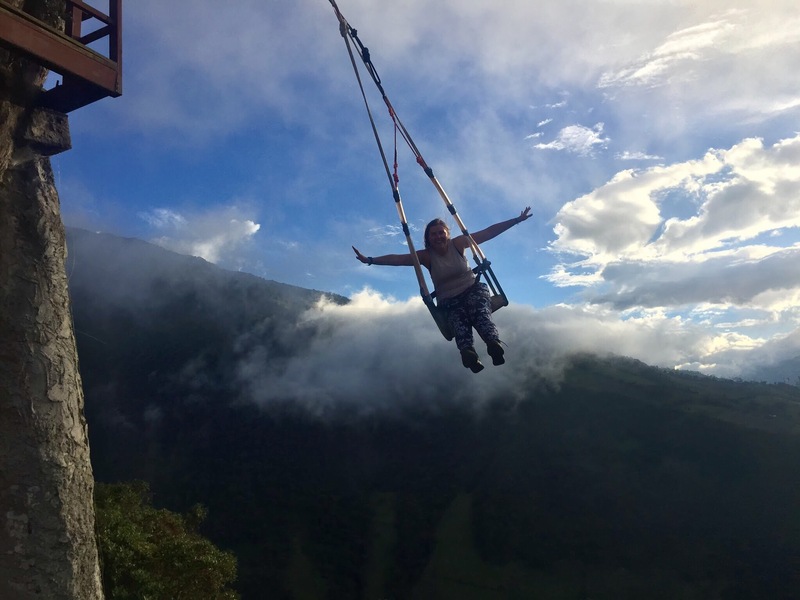 I invited two of the volunteers at the hostel to join me, which to my bad luck they accepted (I didn’t really know them and they were kind of strange) and after collecting some snacks, we set off up the mountain-side in search of The Swing. The track was more of a muddy path and once again I was walking slowly, although this time due to the steepness instead of altitude. The hostel guys stopped for a break after about an hour and I continued on, assuming they would catch up with me. I reached a fork in the road about ten minutes after this and spent a while considering where to go. I decided we still needed to be higher so chose the steeper path that looked to continue climbing up the mountain-side. Even now I don’t know if this was the right choice. After about 20 minutes more, I realised the guys were not going to rejoin me and I was on my own. I adopted a small stick as my new companion and marched on up the muddy hill. I realised I was now walking though a farm with lots of poly tunnels. Doubts were starting to creep in as I had been walking for over two hours and seemed to be in the middle of nowhere. I hadn’t seen another person for about an hour and there weren’t any signs. I even had to walk past a cow that was on the path and I was much braver than with the cat the night before and slipped passed without too much fuss. Soon after this I picked up a bigger stick and realised I was definitely lost when the path suddenly stopped. So I turned back around and headed back to a small side path I had seen a minute earlier – this way I didn’t have to pass the cow just yet. I clambered up the tree-lined path with the help of my stick and appeared at the top of the farm. Here I spotted a more extreme swing than the one I was looking for where you had a harness and were strapped in. Being the only tourist here, I asked a girl playing football with my broken Spanish and Google maps as my aid where I needed to go. With renewed energy and directions, I set off excited to be close and no longer completely lost. Luckily at this point I met two Argentineans and a dog (I named him Fluffy) who were also looking for The Swing. So we joined together and with their Spanish and my enthusiasm we navigated our way to the top in just 30 minutes more. It might not have been the easiest way to get there but it was a real adventure. Finally at the top after over three hours hiking, sweating and so glad I bought snacks, I quickly joined the queue and resolved that I would be taking the bus down (it’s only $1 anyway). Although I had to wait about half an hour for my turn on the swing I didn’t mind because it was exciting and funny watching everyone else take their turn. The man who was pushing the swing on the line I had joined (there are two swings either side of the tree) was a charismatic, hippy kind of guy with lilac dreadlocks and bare feet and he seemed to enjoy scaring the people he was pushing. First he pushes you five or six times very high, then taps your feet and sets you spinning while you swing. He tells you to spread your arms for pictures and then before you know it your turn is over. 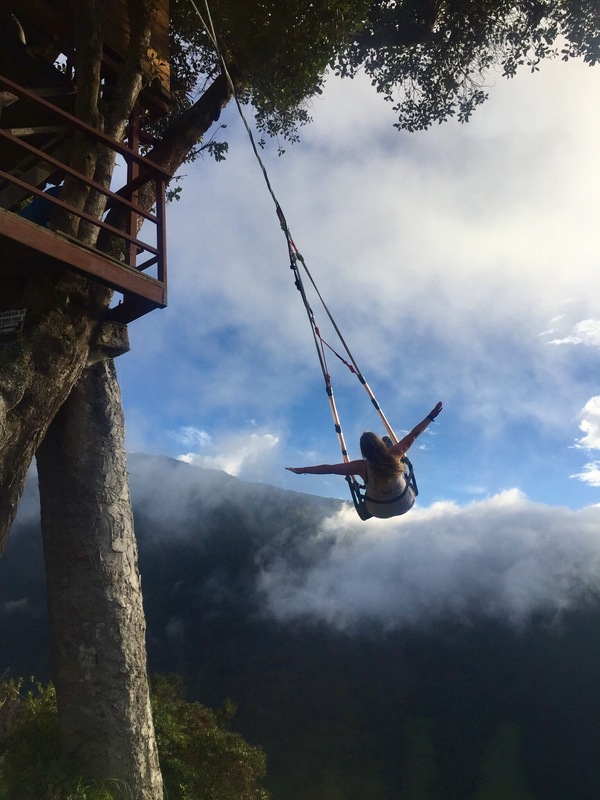 The adrenaline makes it go by in a flash but it was a great feeling of freedom as you swing out into a canyon, like you’re at the end of the world. Thankfully the Argentineans took some pictures for me also so I have some great snaps. 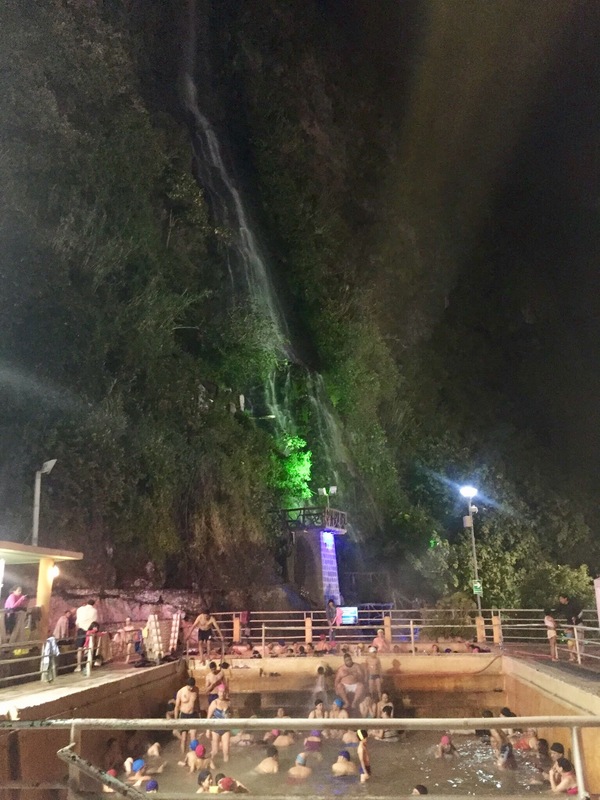 On the way back on the bus, I decided to go straight to the hot springs, La Piscinas de la Virgen, as they were near my hostel. Everyone has to wear a little cap in the baths which makes the whole thing more of an event than just swimming. I got there around 7pm so had to pay $3 – a dollar extra for the evening session – and the place was filled with locals – I had obviously chosen a popular time to go. They have four pools or baths. The first downstairs by the entrance is the super hot one, heated naturally by the volcano to 42°C. I spent most of my time in here – you’re only supposed to spend five minutes at a time but I spent about 20 minutes. It felt like when you run a bath that’s a bit too hot but it never seems to cool down. I hopped in and off the side every time I got a little to hot but because you can’t guarantee hot showers in South America I revelled in the heat. They also have a cold pool which I didn’t try, and two warm pools. One of the warm pools is very shallow and you almost lie down in it and the other is a good height for standing in or sitting on the ledge. 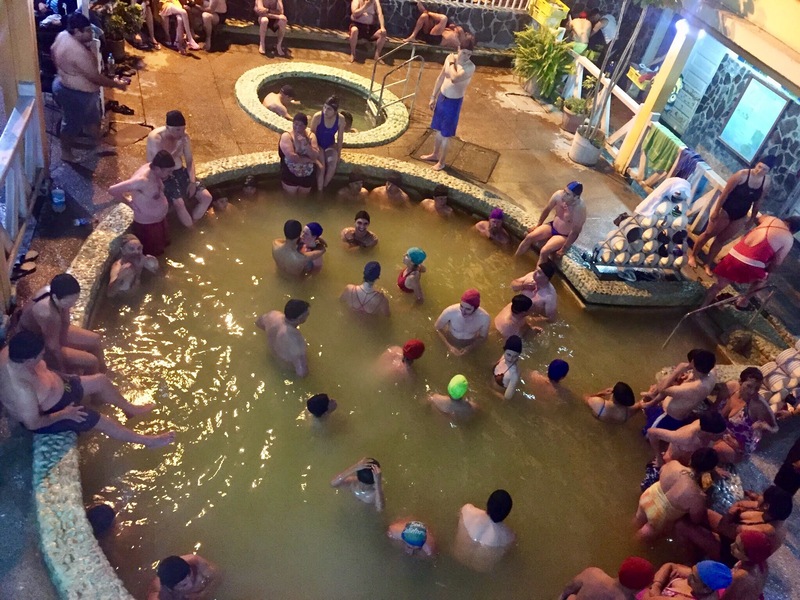 I really enjoyed visiting the baths and although they aren’t unique to Ecuador, they are famous for them so it was really nice to experience them and it was just what I needed after the three hour walk to The Swing. Also the backdrop of the mountains and the big waterfall made it feel more authentic than other attractions in the town. When I got back to the hostel I packed up and moved to a different hostel in the centre of town. Luckily I got a dorm room to myself so it was quiet and relaxed, and most importantly cat free! I had the best dinner in a nearby Italian: chicken, ham and beef lasagne with garlic bread (I didn’t have any lunch though). There was even a Peruvian band playing pipes and drums in the restaurant too. 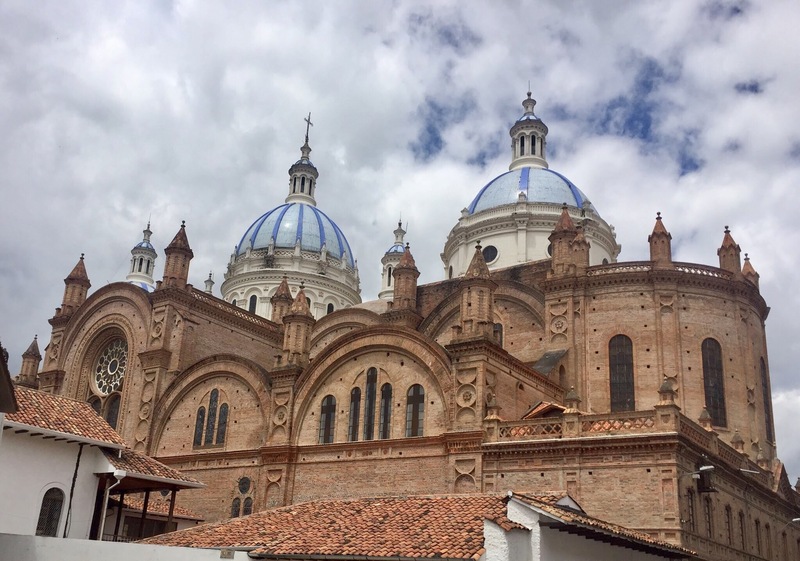 The next day I had planned to move to Cuenca but I decided to take a day out to plan the next stages of my trip, getting to Peru and what I would do there and where I would stay. It was nice to just spent a bit of extra time there, even though it was touristy, just to relax and get my bearings. The next day I caught the early direct bus and got to Cuenca in the late afternoon. When I arrived in Cuenca, after speaking to the staff in the hostel I soon discovered that a lot of my research the day before wasn’t necessary anymore because I could take a direct night bus to Peru from there instead of going to another town first. It would also take me to Máncora instead of Piura which was a better place for me to stop off in Peru too. I arrived in Cuenca on a Saturday evening and on Sunday nearly everything except the churches were closed. 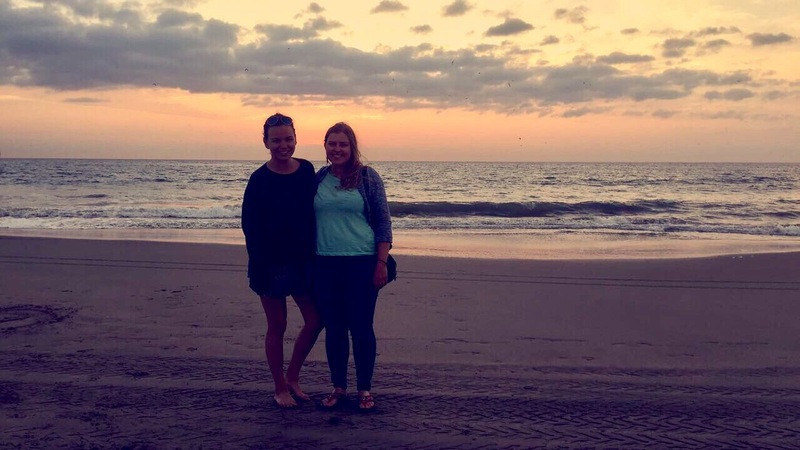 I spoke to some of the other travellers in the hostel and met a really nice Canadian called Justine who was also planning to go to Máncora and so I decided instead of waiting another day, I would travel with her to Peru. It was my first night bus and so I was glad to have some company – I’ve heard this is where most travellers get robbed so I had avoided catching them until this point. Justine gave me a little tour of closed Cuenca and it’s churches, and then we spent most of the afternoon relaxing in the hostel. Our hostel, The Bauhouse, had Netflix and comfy sofas which is the first proper lounge I’ve encountered travelling so far. It also had great WiFi so I’d recommend staying here if you’re passing through. The anticipation for the night bus has been building all day and in reality it really wasn’t too bad. I had downloaded a few episodes of The O.C. season 1 and slept a few hours before we reached the border. Immigration was reasonably painless, we only waited about an hour which was quite good as it can be up to seven but luckily we were one of the first coaches to reach the border. I was quite tired when we got back onto the bus and fell into a deep sleep, hugging my valuables for all they were worth. Lucky Justine wasn’t sleeping so deeply because I would have slept right passed our stop. We reached Máncora earlier than we had expected and ended up on the side of the road in a small dusty town with our bags, no local currency, surrounded by tuk-tuks at 4am! We had only booked the hostel for the next evening, expecting to arrive in the day so weren’t sure what to do. The cash machine gave me two 100 soles notes (not helpful) so we used our dollars to get a tuk-tuk to our beachside hostel, hoping it had 24-hour reception. We were lucky that a couple from our bus were also staying in the same hostel and were doing the same. When we reached the hostel, it really was a beach hut in the middle of nowhere (except for other hostels). Dogs awoke the sleeping owner and after checking in, we were told that the only beds available then were hammocks with mosquito nets. With no other options we put our luggage into the sheltered area and wrapped up for a chilly few hours in the hammock (lucky I’d already slept in one in the jungle in Venezuela). All in all, although we hadn’t planned to arrive at 4am with no money and no plan, my first night bus went pretty well. I didn’t lose any possessions, I slept well and I had great company. And the reward, a few days chilling out at the beach in Máncora before getting extremely sunburnt and catching a 23 hour night bus to Lima on my own. Spoiler: the next bus was fine too (it had fully reclining seats, dinner and breakfast and individual TV screens with English subtitles on the movies) but I didn’t sleep as well because of the sunburn which is still painful nearly a week on. Life lesson: ALWAYS wear suncream.